Currently, our masjid is located in a small house (1900 sq. ft.) that was renovated for use as a prayer hall. However, the current facilities and infrastructure are grossly inadequate for our present and future needs. Austin is one of the fastest growing cities in the U. S. and the local Muslim population continues to expand rapidly. To meet the diverse needs of our fast-growing community, we unveiled an ambitious plan for our Center during Ramadan 2011, the ICBC Master Plan. We believe this vision will ensure a spacious and secure place for our community for many years to come, Insha Allah. Based on the feedback solicited from our community as well as the consultations held with leaders of established Islamic Centers in other cities, the ICBC Master Plan was developed. 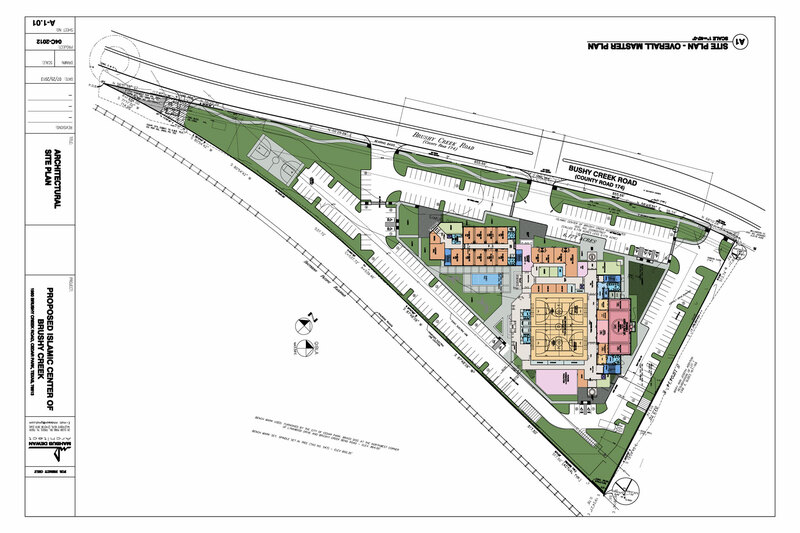 The plan envisions a comprehensive center that will address the needs of Men, Women, Children, Youth, Elderly, Needy and the neighboring communities. At various stages during the planning process, we solicited your opinion and feedback, and organized community meetings to understand your wants and needs, which was greatly instrumental in helping us convert the conceptual Master Plan into a phased-out Implementation Process. 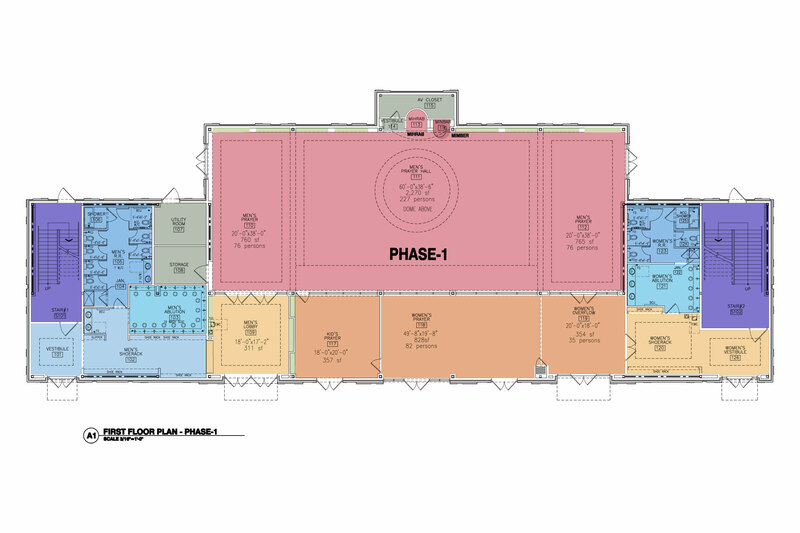 The Master Plan includes a new Masjid, Parking lot, Educational facilities, Sports area, and Multi-purpose Hall. 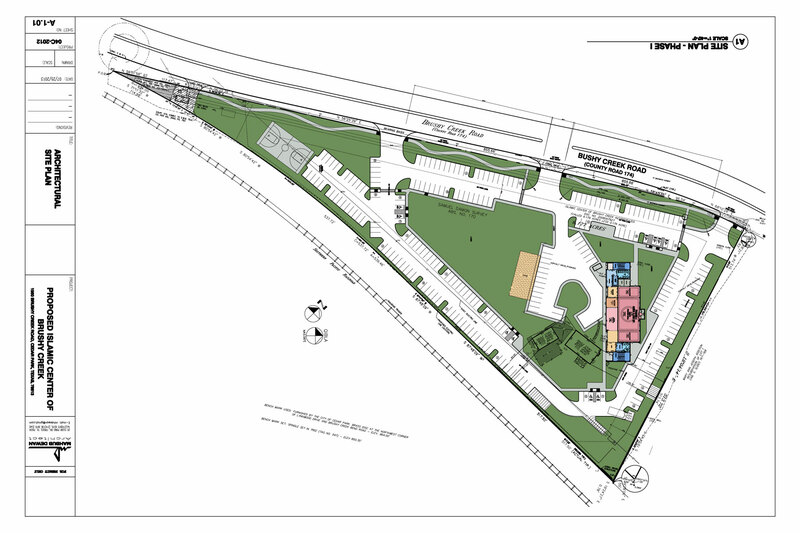 Following a professional and extensive search, in June 2012, we contracted an architectural firm to do the required planning and design work to develop a comprehensive Site Plan, and subsequently obtain the approvals from the City. Taking into consideration the financial resources and limitations of the community and its priorities, the project will be executed in multiple phases. To be executed in multiple phases, Phase I consists of the Parking lot, Masjid, Basketball court, and Playscape for children and is expected to begin in 2014 Q4, Insha Allah. Our community support has always been overwhelming, Alhamdu lillah. We raised over One Million Dollars in the first four years since our founding, which was used to buy the property and for several enhancements. Your financial support towards this noble cause would be greatly appreciated. May Allah (swt) reward you abundantly for your generosity, Aameen!